Making your own bows is a great way to adorn wrapped gifts, gift bags, and more. For that finishing touch that's a little more special, learn how to a decorative bow with multiple loops, resulting in a big, puffy, almost floral bow that's sure to grab everyone's attention. It's easy and fun, you just need to follow a few simple steps. You can experiment with leftover ribbon or create your own ribbon from fabric. Practice it a few times and you'll be a master at bow making and can even have a stash of pretty bows on hand for last minute gift giving. Once you have perfected the technique, you can switch to a very wide ribbon and make a decorative bow large enough for a car or another big gift. Leave a reasonable length tail of ribbon—around four inches, depending on the size of your finished bow. Place the beginning of the bow between your thumb and index finger, keeping the right side of the ribbon up (toward you). Twist the ribbon, keeping the twist between the thumb and index finger. Twist again so the right side of the ribbon faces up on both sides of the twist. Bend the ribbon to create the first loop, bringing the end of the first loop between your index and middle fingers. Place the twist under the first double twist that is between your thumb and index finger. Repeat the second step, alternating between the sides of the bow. Gradually make each loop longer than the previous loop. Create a minimum of three loops on each side of the bow. More loops may be created, but it will get difficult to hold. Slide the center of the wire under your thumb, on top of the ribbon twists. Pull the ends of the wire to the bottom of the bow. Tightly twist the wire to hold the ribbon twists in place. Hold the wire and "puff" the loops to place them where you want them and create a full bow. Trim the tail ends at an angle. Use the wire to attach the ribbon to a package or wherever you want it to be. These look great on flower arrangements and decorative baskets. You can also add the bow to clothing, whether it be on a belt or as a small embellishment for a cute scarf or hat. 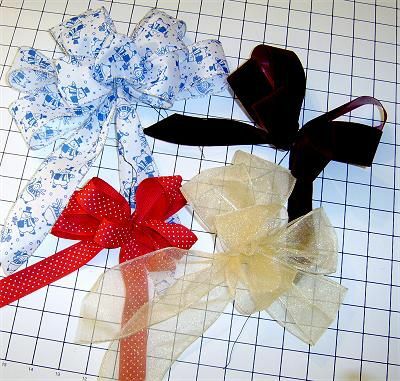 With a thin ribbon, it's fun to make bows to be placed on pins or barrettes, too. The possibilities are endless, so just start twisting!